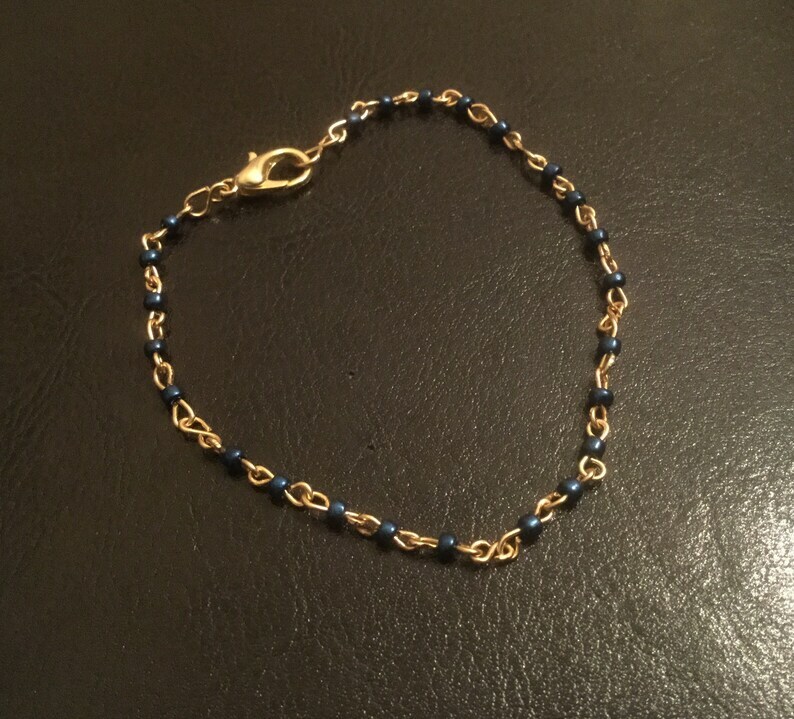 Handmade, brass S links beaded with metallic, blue seed beads. Fits a size 7 wrist, but can be lengthened or shortened on request. Beautiful bracelet - love it! PLEASE UNDERSTAND THAT ALL ITEMS ARE HANDMADE AND WILL NOT LOOK EXACTLY LIKE THE LISTING PHOTO. EACH ITEM IS UNIQUE. All items are unique and one of a kind! No item will be replicated, some may be similar but never identical. PLEASE REMOVE ITEMS BEFORE WASHING HANDS OR ANY OTHER ACTIVITY THAT WILL RESULT IN ITEMS GETTING WET. excessive moisture will cause stretching, discoloration and other irreparable damage. If in need of cleaning use mild soap and damp towel. spot clean! if leather is too tight or stiff, a small pea sized portion of lotion, olive oil, aloe vera gel rubbed in will give items a nice shine, prevent it from cracking and soften it up. Some of the pieces are thirsty, they will absorb whatever oils or lotion you may be wearing. Some items are repeatable creations, most of my stuff will be one of a kind creations. (OOAK) My stuff is usually unique creations that you will never see again. if you order something that has been sold out, understand that if created again for you, that item will NOT be exactly like the original. My usual practice is to make sure you know that I have received your order, I will contact you as soon as I can via e-mail. I will inform you that your order is being processed and then tell you that I will send you a picture of your item upon completion so you can see what it looks like before I ship it off. I usually give you a day to tell me whether or not you like what you see. This is your chance to inform me if it's too dark, too thin, too wide, any cosmetic issues that you see from the pictures as I will send you several shots from different angles. I would like to fix any issues before sending it off to you. After the day is up and whether or not I have received your concerns for any issues or nothing at all, the item(s) will be made ready to ship. I would love feed back upon your items arrival. to know that you received it and as always a review is always appreciated. I check my messages everyday. Ring sizes ar in U.S, sizes. for wrap bracelets you will need to measure you wrist twice or three time depending on how many time you want the wrap bracelet to go around you wrist. Please inform me of this in a message along or before your order. for jewelry for neck or wrists make sure to include an extra inch or two so the item will not be too tight or constricting. I’m sorry if your items don’t make it before certain holidays or occasions, but once I ship it, it is no longer possible for me to control what happens. I don’t run USPS and have no control over weather conditions or neglect that may occur after it leaves my hands. If you need it fast make sure you choose the shipping conditions that will aid in that as well as ordering the items more than one or two days before you need it. Thank you.